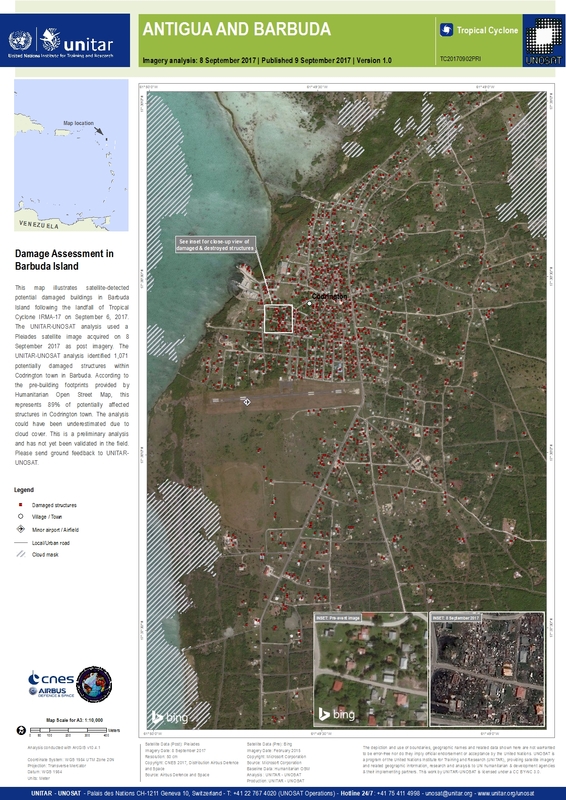 This map illustrates potentially damaged buildings in Barbuda Island detected by satellite following the landfall of Tropical Cyclone IRMA-17 on 6 September 2017. UNITAR-UNOSAT analysis used a Pleiades satellite image acquired on 8 September 2017 as post imagery. We identified 1,071 potentially damaged structures within Codrington town in Barbuda. According to the pre-building footprints provided by Humanitarian Open Street Map, this represents 89% of the total number of structures in Codrington town. The analysis could have been underestimated due to cloud cover. This is a preliminary analysis and has not yet been validated in the field. Please send ground feedback to UNITAR-UNOSAT.